Zachary Hartzog values sustainability. While the senior from North Carolina was always involved in service, he was often frustrated by the limit of his impact. He wanted his contribution to matter in a more significant way, in a truer way to the community he was serving, and he discovered commitment to sustainable problem solving with Design for America. Design for America (DFA) is a multidisciplinary, collaborative student organization that uses a design thinking process to solve community problems. The members engage in five steps towards solving an issue for an identified user group: empathize, define, ideate, prototype, and test. Hartzog said the process is not so much just about solving a problem for the sake of it, but rather focusing on solving the problem for the people involved. “The idea of the design thinking process is that it is human centered, so we design the solutions to these community problems to fit the humans that are involved best,” the senior math and computer science major said. He got involved with DFA during his junior year, when he and now-graduated Honors student Omer Bensaadon worked to revamp the already existing organization. It had become inactive, and the two saw the potential for a productive, impactful community service organization. Hartzog now serves as the process studio lead, which means that he knows the ins and outs of the design process in order to keep the group on track and running efficiently. He works with two other studio leads: Gabie Wingett, who focuses on organization culture, and Annie Meyer, who serves as the community studio lead. Meyer, a sophomore anthropology major from Michigan, works on external relations, whether that is meeting with faculty advisor Dr. Ross Bryan or building up relationships with community partners. The group completed a project in Pickens County with Aliceville Elementary School last year. 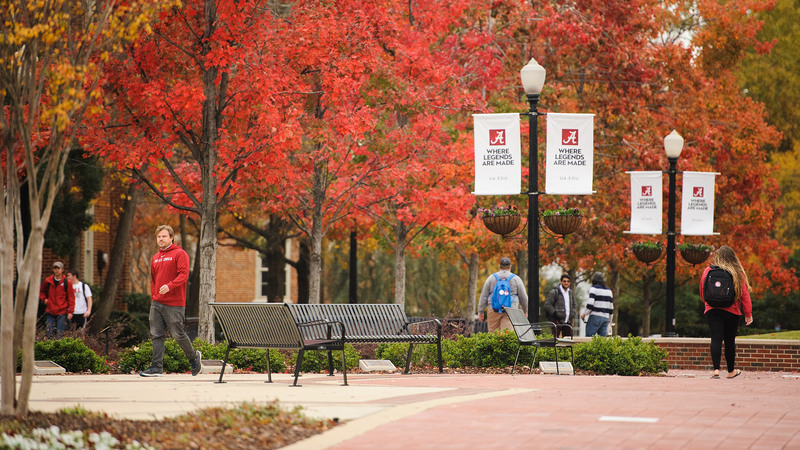 The Title I school is about an hour drive from Tuscaloosa, and DFA developed a relationship with the teachers through connections with the Pickens County Fellowship. Members worked with third graders and developed an after-school program that focused on math skills, nutrition, and academic aptitude through the maintenance of a hydroponic garden. During the empathy stage of the project, DFA members volunteered in an existing after school program at the school called Stars, which focused on homework help. Meyer said she values the empathy stage of the design thinking process because it calls for strong, intentional relationship building. After volunteering with the Aliceville students, they defined the problem they wanted to solve concerning poor nutrition and a lack of engaging school work. The group brainstormed and came up with the idea of using hydroponic gardening as a STEM educational tool. Hydroponics gardening is a technique of cultivating plants in a water-based, nutrient-rich solution. By relying on water instead of soil, Meyer said, the students—or so-called “STEMgineers”—could better interact with the system and become more engaged. Two DFA members prototyped the garden over winter break, and the program began the following spring semester. Hartzog and Meyer said that although few people in DFA at the time had any experience with gardening or writing curriculum, they started from scratch and adapted as they went through the program. After the program took place on Wednesday afternoons, they used Friday meetings to assess its success and make any necessary redesigns. “It was really fun. The students learned a lot about plant growth and they were fascinated by the garden,” Meyer said. At the end of the program, students and DFA members made pizza with fresh ingredients from the garden. After the success of last year’s program, DFA is expanding this year to work with two different communities at the university: international students and students with mental health concerns. The group is still in the empathy stage, attending various international study groups and designing an interview about students’ experiences with mental health services. 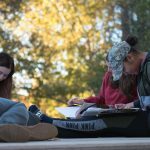 Though last year’s project was successful, their goal is to make a bigger impact on campus itself. 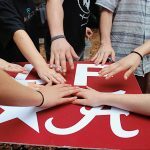 “We want to shift our focus from elsewhere in Alabama to our first person community and the community we experience every day in our lives,” Hartzog said. Additionally, DFA is planning various design thinking studios for the year. These short workshops are open to every student on campus and go over the design thinking process in a clear, succinct way. Meyer said it can simplify an abstract process and show them how to apply this type of thinking to their daily life or future job. Meyer said that DFA has impacted her college experience in many ways, but especially in how it challenged her viewpoint on group work. Whereas she was constantly dissatisfied by group projects in high school, she now appreciates incorporating multiple perspectives when creating a solution. You can find out more about DFA on campus by visiting their Facebook page.